The past 18 months has seen some interesting developments in the Resicast figure range with the introduction of the first BEF troops in 1/35 scale. This development has been followed with a new line of some figures that I am sure will please many British and Commonwealth modellers. This is a look at the first of 4 figures produced for the Western Desert, specifically LRDG soldiers to compliment the Tamiya 1/35 Chevrolet or associated LRDG vehicles. The figure was sculpted by Gerard De Troeye and painting by C Nachtergael. 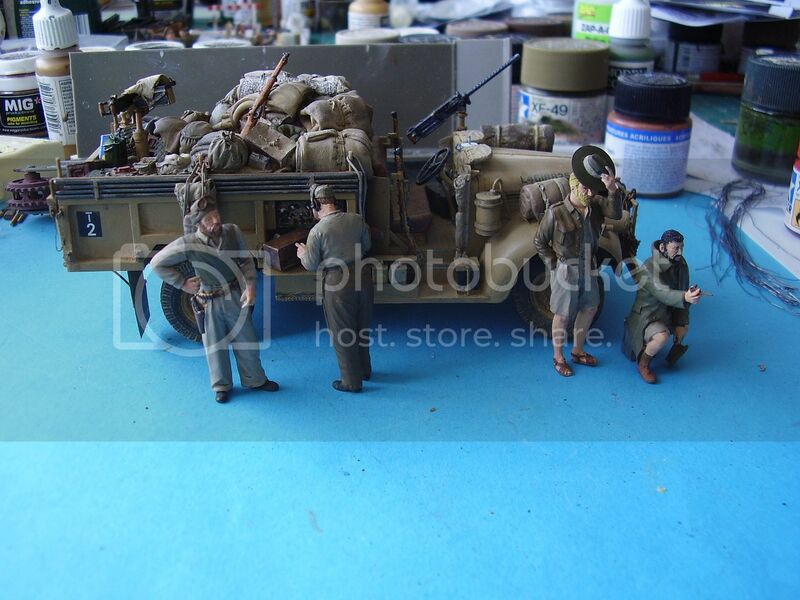 Packed in the standard Resicast format for their figures, the figure depicts a standing radio operator of the Long Range Desert Group for the 1/35 Chevrolet truck. The parts are packed in a small zip plastic bag, and then a second larger zip plastic bag that contains a photo of the completed figure plus a coloured information sheet outlining the clothing being worn and three colour pictures of the completed figures. The figure is cast in a light grey resin and consists of 4 parts. The body is cast as a whole with separate arms and head. The figure is dressed in typical desert clothing consisting of a mixture of clothing: Battle Dress Trousers No 37 pattern, a standard issue shirt covered with a light weight wool jumper. A pair of boots complete the dress. The arms which are separate items have nice jumper and shirt cuff detail at the wrists and the hands are nicely done. The head sports a cap comforter and headphones. The face shows that of a mature man with a beard, the facial detail is excellent and the look on the face very appropriate. The uniform has nice folds/creases, the trousers have all the right pockets in the right places, and overall the detail looks excellent. The figure measures approx 44mm from heel to shoulder and has good body proportions. This is an excellent figure, well sculpted and cast. The mixed order of dress is one I’m very glad to see and this chap will look the part of an LRDG Trooper operating the radio beside a parked truck. The clothing being mixed and generic lends the usage of the figure to a much wider scope and possible settings as a simple change of head will make him useable across many theatres of operation, form the desert of Africa to a prison camp in NWE. It is probably worth mentioning here that Graham is working on a new right hand side panel for the Tamiya kit to correct the errors with the radio housing. An additional image of the figure is shown below. Highs: Excellent sculpting and casting - good possible generic use.